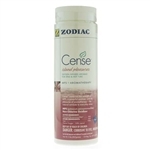 Cense is the only non-chlorine oxidant that offers the stress-relieving benefits of aromatherapy with a crystal clear spa experience. Combining fragrance with MPS, the most recommended oxidizer for spas on the market, Cense creates an inviting and relaxing environment in and around your spa by eliminating the chemical smell of chlorine and replacing it with four exquisite scents as it leaves your spa water cleaner, clearer, and fragrant. 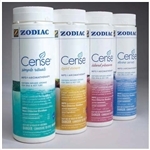 Spa Fragrances designed specifically for the hot tub experience. The new Spa Crystals fragrance line features a unique blend of plant extracts and essentials minerals that blend in perfect harmony to create the only fragrance crystals formulated specifically for the spa/hot tub industry. Six fragrances to choose from! The Water Brick Hot Tub Booster Seat is designed to give you a boost in that hot tub seat that is a little to deep. The Water Brick Booster Seat is cushioned for maximum comfort and designed to be filled with washed pea gravel or marbles to ensure that it does not float to the surface. Made of high quality materials and fabrics for years of enjoyment. Replacement Drop In Filter for Integrity Spas' Tahitian, Montego Bay, Fiji and Antigua spa. Replacement Screw In Filter for Integrity Spas' Swim Spas, Hawaii, Oahu, Paradise, Big Kahuna, Bali, Bimini, Molokai, Maui and Rum Cay. Our newly redesigned Handi Steps for spas are created with maximum value and versatility in mind! Assembly is as simple as it gets: just a few snaps and you have an inexpensive, nice looking, maintenance-free step for your hot tub. Whether purchasing a new spa or just need to restock on supplies, our Amerse Nature2 Cense Start Up Kit features everything you need! This kit features the Nature2 Mineral Stick, an eco-friendly, low maintenance alternative to heavy chlorine or bromine, along with Cense Aroma Therapy shock, the only non-chlorine oxidant that offers the stress-relieving benefits of aromatherapy with a crystal clear spa experience. 4 Pack Replacement Screw In Filters for Integrity Spas' Swim Spas, Hawaii, Oahu, Paradise, Big Kahuna, Bali, Bimini, Molokai, Maui and Rum Cay. 4 Pack Replacement Drop In Filters for Integrity Spas' Tahitian, Montego Bay, Fiji and Antigua spas. This rail maximizes safety and keeps slick surfaces from getting in the way of your relaxation. 36" Storage Steps feature a removable storage container with a care-free finish for a long and maintenance-free life. Available in five rich colors. The Cover Valet™ is the world's leading premium spa cover removal system. It is designed to fit in almost any back yard environment; inside of a gazebo, against a wall, or even mounted into an existing deck. The Cover Caddy gas spring assisted cover lift defines versatility and effortless spa cover removal. It's unique design allows for installation on an array of spa shapes and sizes including round, octagonal, and spas with large radius or cut corners. 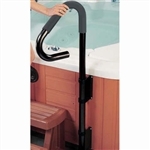 The Spa Side Handrail™ is the most user friendly spa side assist product on the market. This device provides 360° of movement to allow for easy spa entry and exit. An added locking feature enables the handrail to be fixed in any position for increased safety and peace of mind. The Spa Side Handrail slides under the spa cabinet for complete installation and requires no hardware or assembly. The attractive carbon gray powder coat is accented by the new battery-powered LED mood lighting located on the interior curve of the rail. The WF-100 WiFi module allows for integration with our control systems. The WF-100 gives you the connectivity to access and control, your spa control system. Allows access with any laptop, smartphone or tablet. YOU ARE COVERED RAIN OR SHINE! This elegant, European-designed umbrella lets you enjoy your spas regardless of the elements. Powdercoated 2 1/4 inch aluminum tube construction and premium Sunbrella® material make this umbrella both durable and stylish. Finally, an umbrella that performs the way you expect.